Help your rabbit to catch the falling apples - It's easy! 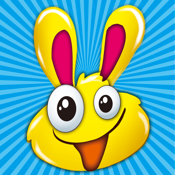 Use your finger to move the rabbit across the screen and let it catch the apples. But be aware: If you miss an apple or catch a rotten one, you loose one life. To restore your life balance, catch the next golden apple falling from the tree. Also, be careful to avoid the bad rabbits! If a bomb comes out, please catch it.